Apache contractors industrial water/garden hose. 100 percent rubber, heavy-duty MGHT x FGHT solid brass couplings and one bend restrictor. Resists sunlight, abrasion, kinking and cracking; flexible in freezing temperatures. Bend restrictor promotes longer life. Temperature range -40 to 200 degrees F. Note: hoses used to transport hot water MUST NOT be used to transport pressurized steam. 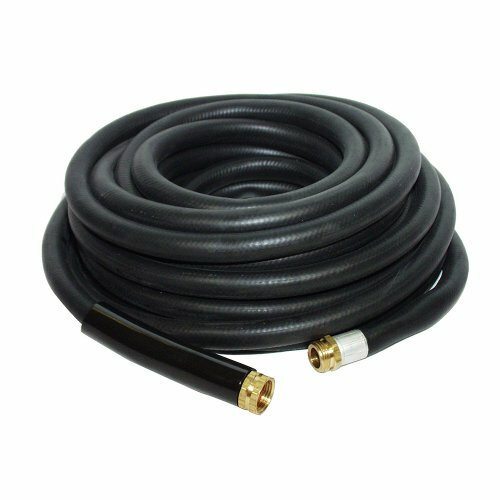 General and multi-purpose hoses are NOT intended to transport water for human consumption. Made in USA.